As the name suggests these consist of aramid fibre facings bonded to a tinplated or zinc coated steel core. The adhesive used is resistant to oils, fuels & coolants. The strength of the material makes an ideal medium for sealing engines with narrow bore bridges. These are composites with a perforated and tanged steel core with aramid fibre facings and provide a mechanical bond between the facings and core for improved durability. An adhesive can also be used to bond the facings and prevent coolant leakage along the core line. This construction is used for medium to heavy duty cylinder gaskets as well as for smaller engines. These are similar to the steel core type with the exception of the facing material which is cut back from the cylinder bore area. An eyelet is then closed over the protruding core which itself can be embossed to improve sealing performance. A compression ring can also be included in the assembly. 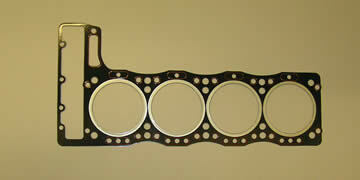 This type of head gasket is used on diesel and racing engines. We can provide a wide range of composite cylinder head gaskets to the highest specifications. In some cylinder head gaskets it is necessary to reinforce local areas of the gasket body to equalise the load and to improve the sealing characteristics. This is accomplished by applying a silicone elastomer through a silk screen on to the surface.